The Da-Lite Cinema Contour 65 x 116" Fixed Frame Front Projection Screen - Cinema Perf HC (High Contrast) is available in sizes from 60 to 240" diagonal in video format and 92 to 220" diagonal in HDTV format. Cinema Contour has a 45° angle cut frame for a sleek, modern appearance. It provides a perfectly flat viewing surface for video projection applications. 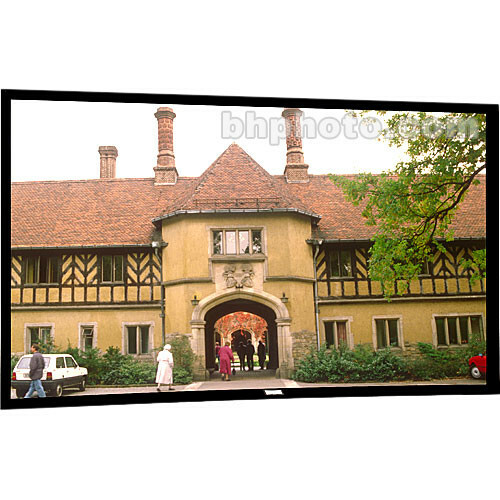 This screen is perfect for those scenarios where a standard, fixed frame screen is needed at reasonable cost and minimal fuss. No bells and whistles - just a simple rugged and well-designed screen for business, corporate, educational and general needs. Da-Mat, High Contrast Da-Mat, Da-Tex, Pearlescent, Cinema Vision, High Contrast Cinema Vision and Dual Vision up to and including 12' high will be seamless. Audio Vision, High Contrast Audio Vision and High Contrast Cinema Perf fabrics up to and including 8' high will be seamless. High Power fabric up to and including 6' high will be seamless. Finish Cinema Perf HC (High Contrast) ; fire and mildew resistant; Screen surface standard with reinforced black webbing on all four sides and will attach to frame with metal snaps. Screen frame will be 3 x 1-5/8" (WD) with a tapered front edge to reduce shadows on the viewing surface. Masking Options Surface mounts to back of black powder coated frame that provides a masking border.